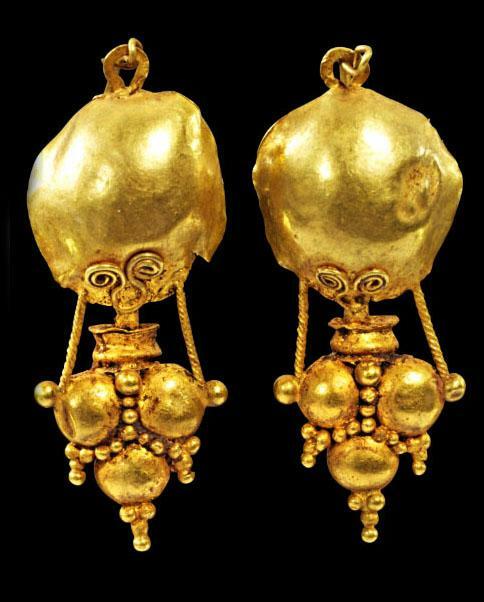 Impressive gold earrings with hemispherical tops and grape extension of four beads with granule decorations attached with two twisted wires, on which a round shield sits with two small wire volutes. weight 6.19 grams. Size 1-1/2 inches (4cm) L. + custom base. Provenance: Ex Shlomo Moussaieff Collection London, 1948 - 2000.